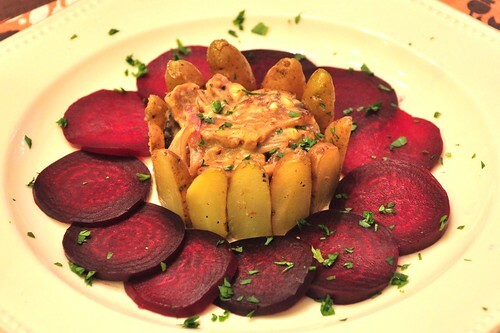 It's PotatoHenge™ redux -- This time with seitan stroganoff (recipe) and fingerling potatoes surrounded by a moat of pressure-cooked beets. To make your own PotatoHenge™: boil the potatoes for 15 minutes, drain and cut off the bottoms and then slice them in half, the long way. Roll them around in some soy margarine, and season with salt and pepper. Using a large ring mold, place the cut side touching the mold until you've gone all the way around without any gaps. Then add the stroganoff in the center and let stand for a couple of seconds. Remove the ring mold and your PotatoHenge™ is complete! Tonight's meal courtesy of a guest chef -- our son. Every Christmas, my sister-in-law gives me a huge box of cookbooks from various regional library sales. Some are duplicates, some are dated ("Robin Leach's Healthy Lifestyles Cookbook: Menus and Recipes from the Rich, Famous, and Fascinating" anyone?) and some are cookbooks that we would never have picked up on our own -- these are often the most interesting. Case in point: "Rao's Cookbook" from 1998. Our son caught a bit on cable about the famous old-school Italian restaurant and realized we had the cookbook in the library. It was a good primer on that most basic of red sauce: marinara with basil. 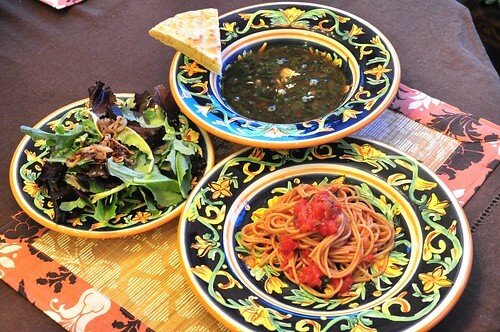 So, we picked up some San Marzano tomatoes and let him pick the rest of menu -- and as you can see, he did a great job! 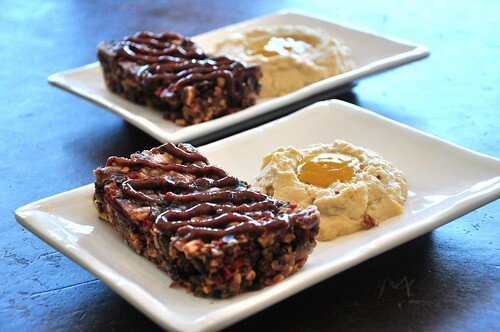 We brought back one of our favorite raw meals -- the meatloaf (mushrooms, sun-dried tomatoes, nuts) topped with prune ketchup. The recipe for both are here. In a large dutch oven, on medium-high heat add 1 tbs. olive oil and saute the seitan cubes until browned on all sides. You will probably need to do this in batches. Remove to a plate and keep warm. Add an additional 1 tbs. of olive oil and saute the onion and carrots with a pinch of salt about 4-5 minutes until softened, then add the garlic and cook for one additional minute. 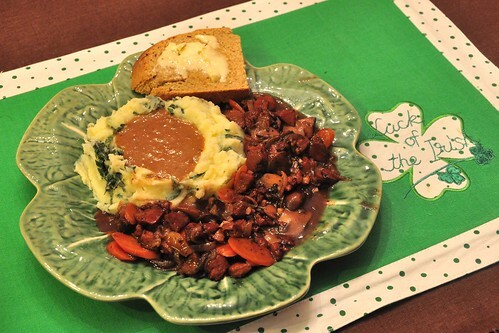 Remove to a plate and keep warm. Add an additional 1 tbs. olive oil and saute the mushrooms with a pinch of salt until they've lost their water and browned, about 7-8 minutes. Keep stirring so they don't stick to the bottom of the pan. Add 1 tbs. tamari and cook for an one more minute. Add the seitan, carrots, onions and garlic back to the dutch oven. 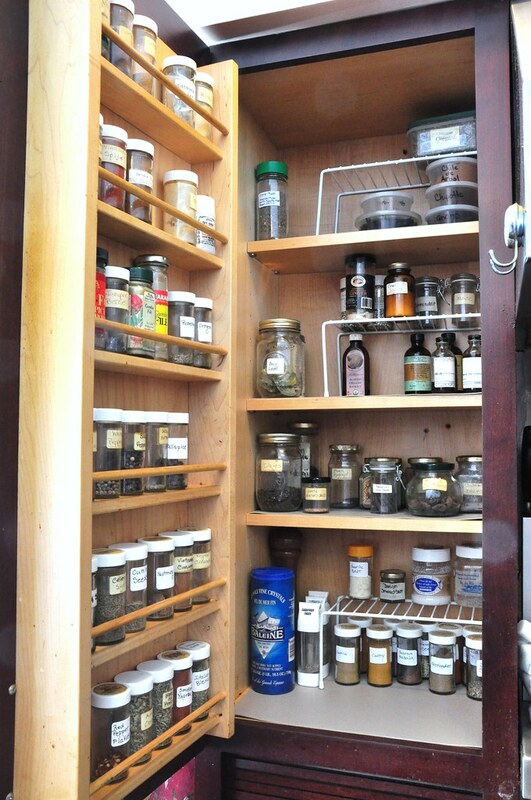 Add pepper to taste, a pinch of thyme. Add the flour, stir to combine and cook for 2-3 minutes. Turn of the heat off and slowly add the whiskey. Turn the heat back on and CAREFULLY ignite the whiskey. Some folks like to tip the edge of the pot towards the open flame -- for the less adventurous (including us), we stand (way) back and use a hand-held igniter. Let it flame for a good 30 seconds then place the lid on top to extinguish. Add the wine (we used a 2005 Cotturi Estate Zinfandel) and water, bring to a boil, reduce to a simmer, put the lid on and cook for 1 hour, stirring occasionally. Check to see how thick it is -- if it still seems too liquid-y, leave the lid off and cook for an additional 5-10 minutes. It was one of those Tuesday "clean out the refrigerator" nights, finding things lurking in the crisper or on the back of the fourth shelf. It's almost a bit of an Iron Chef or "Chopped" kind of game -- find a way to use seemingly disparate foods in a cohesive manner. So, in tonight's mystery basket: cremini mushrooms, carrots, onion, celery, brown lentils, tomato sauce, chiocciole pasta, and two heads of broccoli. We pressure cooked the lentils (16 minutes, first ring), roasted the broccoli (olive oil, salt & pepper, 450F, 15 minutes), made a quick tomato sauce (onion, celery, carrot, garlic, smoked paprika, tomatoes), sauteed the sliced mushrooms (splashed with tamari at the end of cooking) and cooked the pasta. 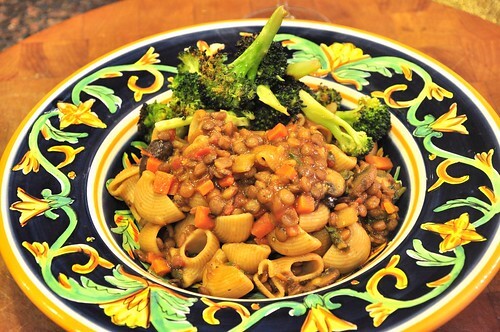 To finish we combined the sauce, the lentils and the mushrooms and let cook together for a few minutes and served it over the pasta, topped with the roasted broccoli. 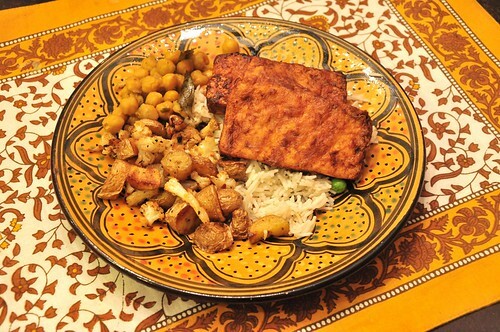 We made the tandoori tofu again -- working on another, uh... "thing" -- as well as roasted fingerling potatoes (tossed with olive oil, cumin, salt and pepper roasted at 450F for 40 minutes). 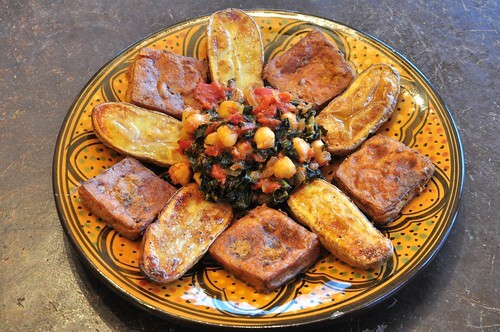 The center of the plate was a test recipe for Isa -- curried chickpeas and kale -- which brought a good deal of complexity through the spices to elevate the entire dish. 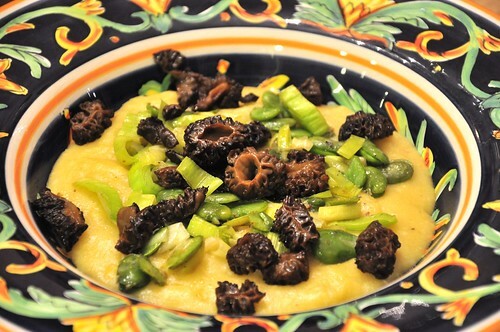 This is a test recipe for Isa Chandra Moskowitz's next cookbook. As part of the testing agreement, we can't give out the recipe. Sometimes, it's a long slow braise that brings out all the flavor. 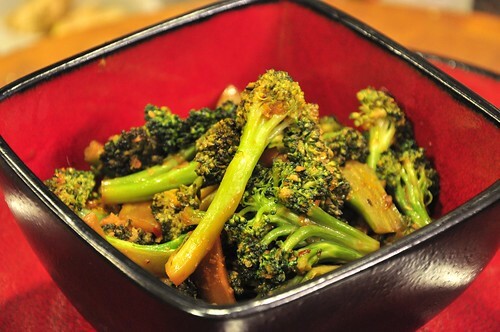 Sometimes, it's something as simple as adding a little orange zest/juice to make the broccoli "pop" in your mouth. 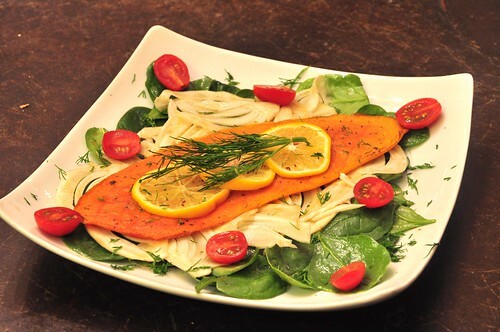 The base was spinach and fennel (sliced thinly on the mandoline), both tossed with an orange vinaigrette, with the addition of lemon slices (to rub on top of the papaya) and minced dill. 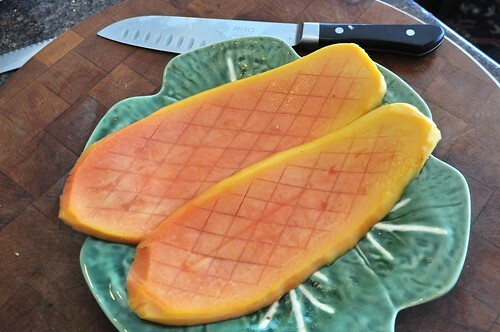 We started by slicing the papaya on a mandoline about 3/8" thick, and then scored it with a knife in a crosshatch pattern to allow for better marinade penetration. Kinda looks like big orange clown shoes, doesn't it? 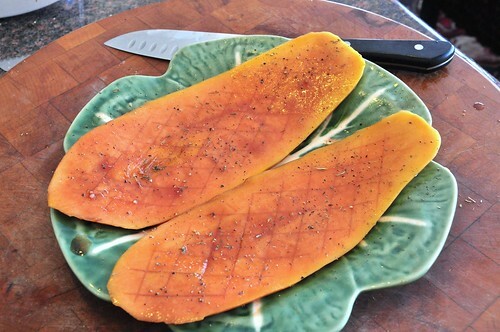 The papaya slices were brushed with a marinade consisting of 1 tbs. each of olive oil, nama shoyu, and an unfiltered/unfined red wine (Coturri Zinfandel), with 1 tsp. of minced shallot, 1/2 tsp. of minced garlic, 1 tsp. of minced thyme and then seasoned with a pinch of herbes de provence and pepper. Kinda looks like a pair of wacky orange ties, doesn't it? 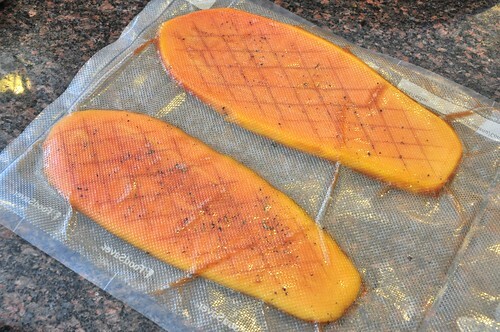 The papaya slices were then vacuum-sealed and put in the freezer for 24 hours. The next day, they were taken out and defrosted in the refrigerator for a couple of hours, then removed from the bag and put in the dehydrator for 2 hours at 105F. Flip them about halfway through, and keep an eye on them so the edges don't start to curl up. Kind of looks like big orange snowshoes, doesn't it? 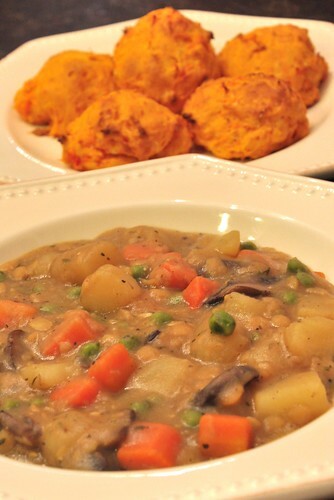 The drop biscuits combine the sweetness and color from the potatoes with a quick and simple recipe that results in a vibrant and tasty accompaniment to the hearty (and filling) Veggie Pot Pie Stew. 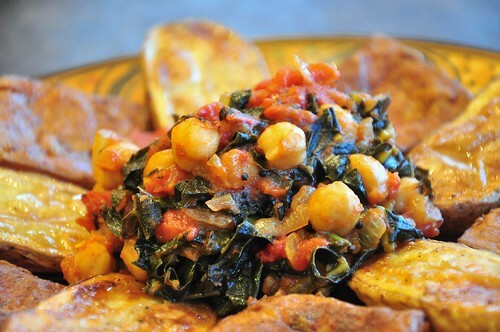 More TV cooking tonight, this time a veganized Daisy Martinez set of recipes. The braised fig recipe starts off very French with the brown sauce recipe (subbing homemade hickory-smoked tempeh bacon and veg stock) and a shot of cognac to deglaze the pan. The tofu was also hickory-smoked, pan-fried and thrown into the sauce at the last minute rather than spending an hour in the liquid. That's because the tofu gets very soggy from braising which doesn't really work as a texture for cutlets. 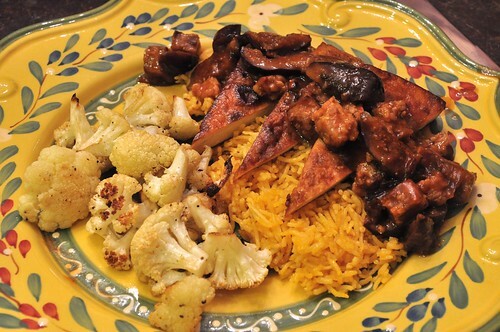 Surprisingly, the smoked tempeh cubes hold together in the sauce pretty well. 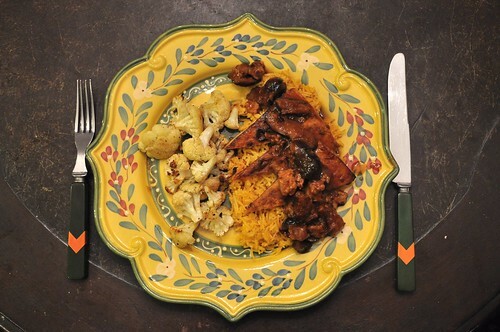 The tofu and fig sauce were served over rice, colored with achiote oil and flavored with sofrito, olives and veg stock. The real reason for including this overhead shot is to show off my belated Christmas present from my sister-in-law -- a lovely green Bakelite silverware set with an orange chevron motif. We made Pani Puri (a.k.a. panipuri or golgappa) for a change -- a smaller sized puri that used 3/4 cup of semolina flour + 1/4 cup of AP flour with a pinch of salt and oil. 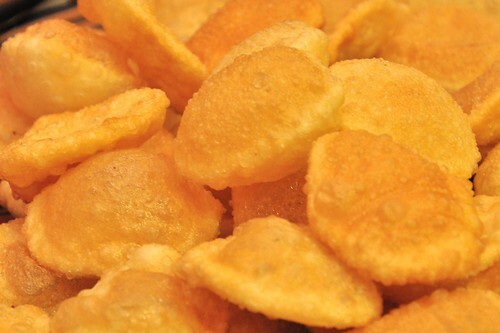 They puffed up nicely in the hot oil into small globes that were crisp enough so that you could poke a hole in the top with your finger and fill them with either the channa masala or aloo gobi and dunk them into a spicy tamarind "water" and pop them whole into your mouth where they explode with flavor. Really fun and tasty.